Medan Selera Stadium is one such food court; A pool of stalls occupying the whole stretch of lots under those classic zinc roofs, fixed plastic tables and stools, and still practising the ‘order from the respective beverage stall’ rule. Which means that if you’re seated within the zone of A stall, don’t push your luck and order your drinks from the B stall a few lots away. Lest you feel like testing the waters, or rather, patience of the traders. 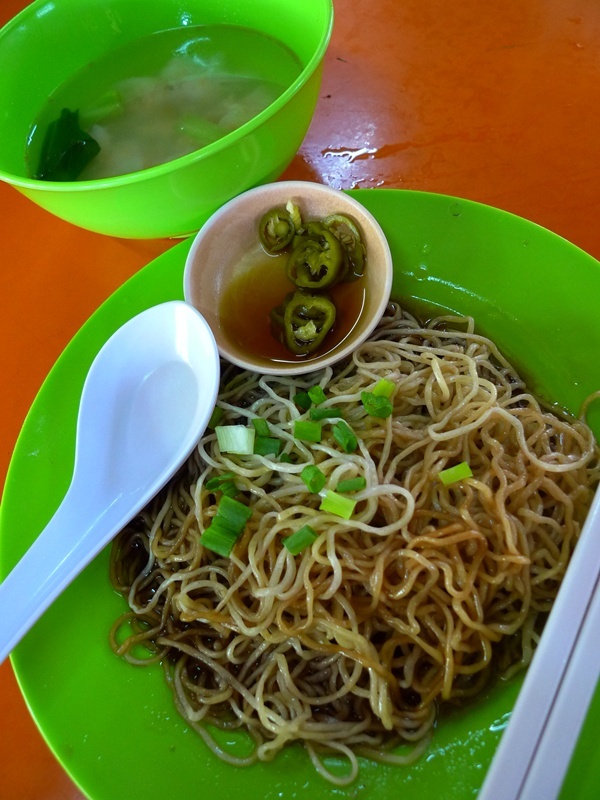 The fried noodles stall named Seng Loong (ironically, a moniker that the legendary Jackie Chan has been adopting over the years) numbered 32, is opened from 7.30am until 3.00pm, serving his brand of Char Koay Teow to the breakfast-brunch-lunch crowd. Technique-wise, the noodles was fried with sufficient ‘wok hei’, or heat from the wok, resulting in the dry, smoky and charred slivers of flat rice noodles intertwined with yellow noodles (I opted for the mee and ‘hor fun’ combination), generously mixed with bean sprouts, chives, prawns, and of course, eggs. 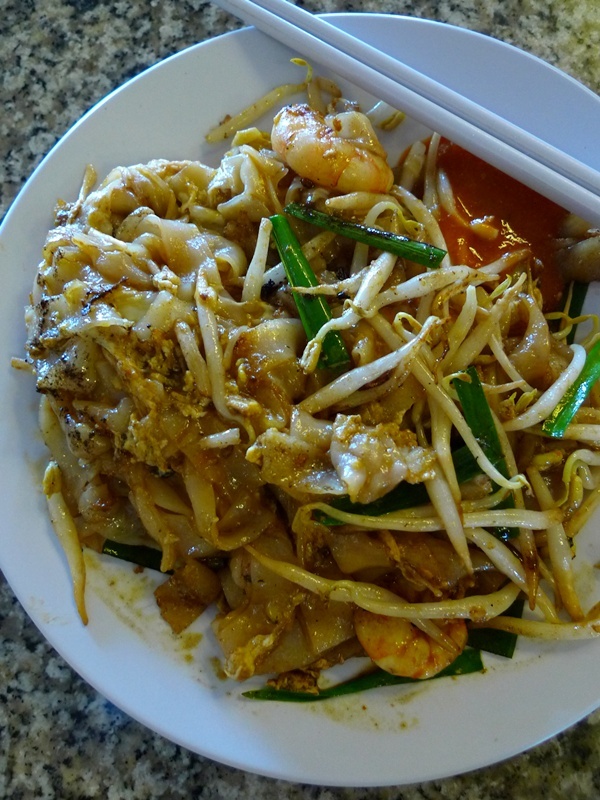 Still far from the Penang’s almost orgasmic varieties (notably, Sin Wah at Pulau Tikus market, and everyone’s favourite Ah Leng Char Koay Teow on Jalan Dato Keramat) but Seng Loong’s one of the better ones in Ipoh, I reckon. 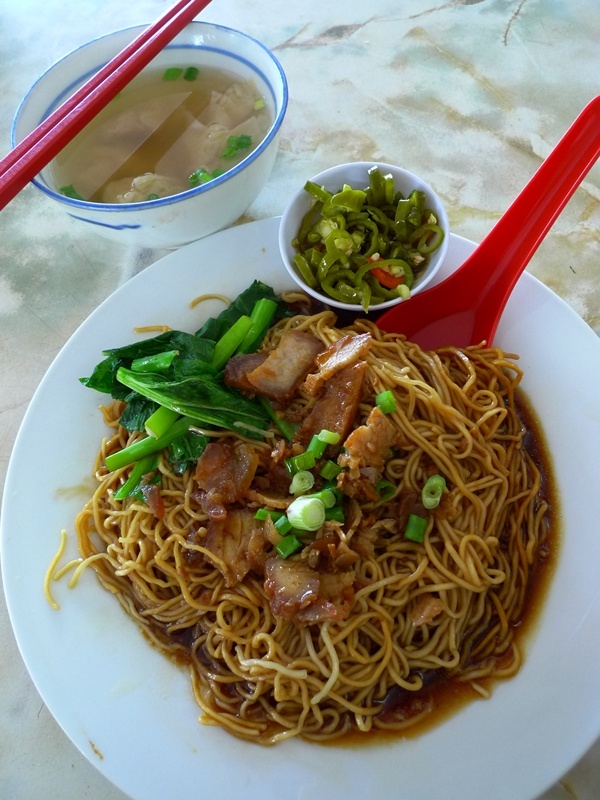 The Wantan Mee in stadium is another crowd-puller, for you can ask any Ipohan for good wantan mee in Ipoh, and this one in stadium is bound to be mentioned. Another stall, numbered 36 … or 22, I forgot which opens at night, while the other opens from morning until noon. Go figure. But the row of stalls are one after another, running about 200metres in total, at most? 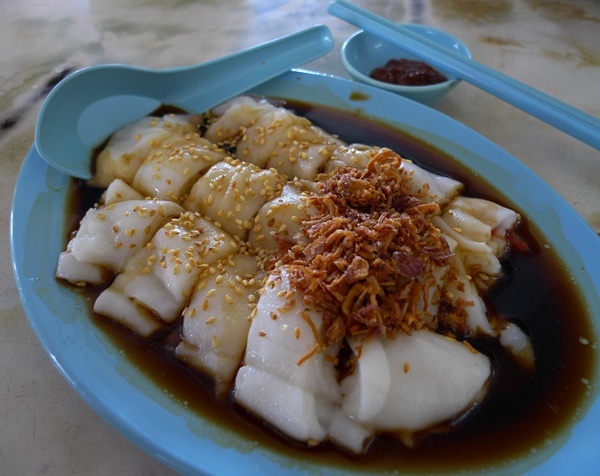 Other appetizing hawker fares found in Medan Selera Stadium are for example; Ais Kacang (Shaved Ice with Condiments and Sweet Syrup), Nasi Lemak (early in the morning until lunch) with a killer ‘sambal sotong’ (at the far end of the rows, nearer to the swimming pool), Sri Asoka Corner’s Banana Leaf Rice (click for my post on the famous banana leaf curry rice), Hong Kong Chee Cheong Fun, and many others. If you’re on a tight budget, one hand feeding the mouth while the other’s working round the clock, then you’re in for a treat, as a meal at the food court rarely touches the RM10 mark. Unless you go crazy with the orders, that is. With an option of either prawns, or char siew (cubed barbecued pork), or a combination of both, the HK Chee Cheong Fun is served in soy sauce and garnished liberally with fried shallots on top, giving it that extra fragrant and crunch. At about RM2.30 for the small serving, this one beats the one in stadium, the one at Tung Koo Ting (Medan Selera) opposite of Woolley Food City, and even the ones in dim sum outlets such as Foh San. Homemade style lean Char Siew, without the caramelized edge ….. beautiful pickled green chillies though. @ Kafe Sentosa. Other delightful street foods available at Kafe Sentosa include the continuously patronized Chian Kee Mee Goreng stall which fries up some mean combination and variation of noodles (though it may take some time come breakfast hours), the Wantan mee stall which pales in comparison to the others, and even a Western food stall serving Chinese-style of American breakfast (irony? ), sandwiches, etc. Map to the coffee shop to come at the end of the post. 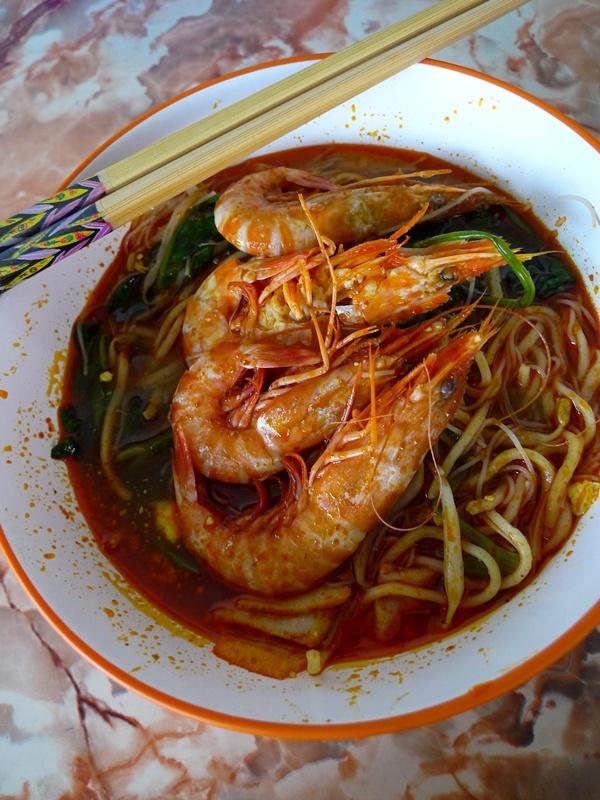 The bowl of fiery looking prawn mee (or Hokkien Mee, as they call it in Penang) was tapau-ed (takeaway) and savoured at home this afternoon. Yeah, very fresh recollection of the slurpilicious experience. Hehe …..
At only RM3.00 (yup, you’re NOT seeing stars) per bowl, the proprietor is in fact from Penang, and speaks minimal Cantonese. A little spicier than the average ones, but the reddish hued broth is such a sweet, spicy and of wholesome goodness, complemented perfectly with 4 shelled prawns, water convolvulus (kangkung), lean pork meat and bean sprouts. You can choose to include pork ribs instead of meat, depending on your preference. Problem is, I have only been to the shop once, on a Sunday morning. But the stall was closed that morning, after the Mid Autumn Festival celebration the night before. Hence I had some mediocre egg toasts, and did not bother to check out the name of the two-shoplots restaurant. But it’s situated on Jalan Yang Kalsom, a short distance away from Yong Suan Nasi Ganja, and a few shops away from Up And Up, the famous Chinese eatery in Wisma Kinta serving fish head curry. !!! UPDATED (25 Oct 2009) – The name of the coffee shop is Restoran Sen Yee @ 25-27, Jalan Yang Kalsom, Ipoh, Perak. Map to come at the end of the post. !!! UPDATED (2 Apr 2010) – The prawn mee stall is not there anymore. Sadly. 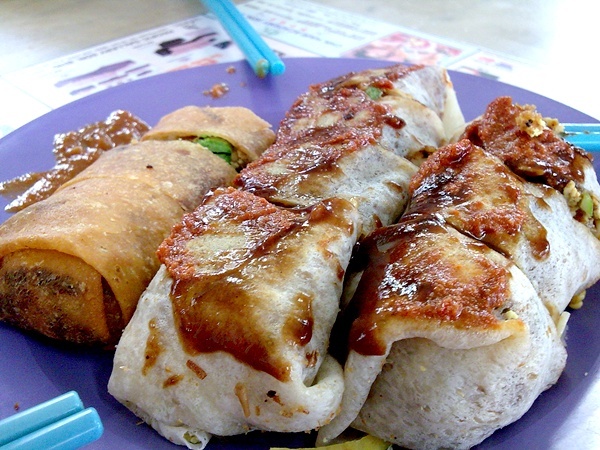 One of the BEST Popiah in Ipoh … and definitely most popular. Challengers? The one that sells on a backlane in Ipoh Garden-Canning Garden comes close. Kong Heng in old town of Ipoh is no doubt, hands down THE most famous coffee shop in Ipoh. Probably one of the most recognized in all of Malaysia, or am I exaggerating here? A most nostalgic coffee shop in old town, on Jalan Bandar Timah (read my previous post HERE, dated more than a year ago), Kong Heng was notorious for the stall owners would walk over to your table once you’re seated comfortably, and start to ramble off a list of their dishes. Yup, imagine once seated and before you get to order your drinks, you’re swarmed by people left and right, ala paparazzi style. But nowadays, things are different, and they’re not as aggressive as before. Except one or two of them. Even the infamous pork satay uncle (seemingly rumoured to recycle the peanut sauce!) stays dormant, and chooses to man his stall, rather than plonk a plateful of the thick cuts of pork on skewers and gizzards/offals/whatever on your table so that you can eat to your heart’s content, and returned the untouched ones at the end of your meal. The Popiah stall has changed hands. Maybe not many realized this fact, but old timers would have noticed that the stall does not serve laksa anymore. The aunty who popularized the Popiah has in fact, retired and the stall is currently under the helm of another. Not sure if they’re related, but the quality of the Popiah remains tip-top, with the same big servings of either the original steamed popiah skin, or the crunchy deep-fried variant. And the unforgettable slightly thick sweet sauce smothered on top. At RM1.70 per piece, you’re paying for the quality, the taste, AND the legacy. And the modernized Woolley Food City in Ipoh Garden rounds up the Ipoh Street Food Saga …..
Old town’s rather intimidating in terms of traffic, and limited parking spaces? But still craving for hawker food, and preferably in a comfortable environment? Look no further than Woolley Food City, a huge food court recently underwent renovation, now housing an astounding 20 or more stalls. Notable street foods include the Char Koay Teow (albeit a little oily), the Vietnamese cuisine (same management as Vnam Kitchen in Greentown), the South Indian curry rice formerly from Ipoh Garden South (quality has gone down, price has gone up! ), the cheap bento sets from the Japanese food stall, and the Chinese pancake (woh peng) from the Chee Cheong Fun stall. So, where’s YOUR favourite spot for Ipoh Street Food? Of course, this post is far from exhaustive, and merely a filler to clear up the backlogs of photos, some even taken with my camera phone, before I start brandishing my LX3. Here’s the amazing GOOGLE MAP to all of the places mentioned above. Ultimate Ipoh Food List !!! 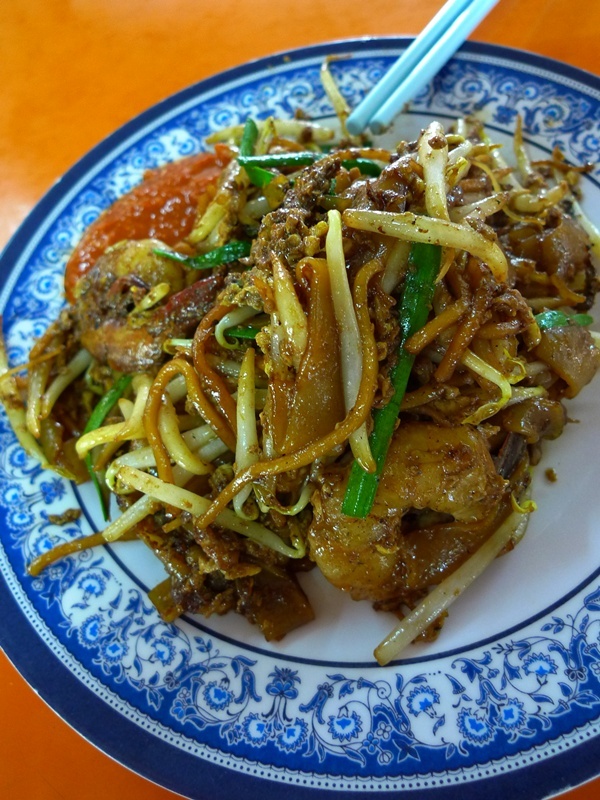 Or, you can also read my article published on Rasa Malaysia’s website on 1st April 2010.
dun go seng loong char kuey tiao, the boss very lun see one, wait long and scold customer one. Went back to Ipoh last week and found 2 “Ching Tong Fun/Liew stalls. One is located at Medan Selera Stadium and the name of the stall is ‘Kg Simee Noodle” It’s run by a brother/sister team. Very popular and only operate in the morning.Located in the middle of the Medan Selera.. Another unexplore by anybody yet “Ching Tong Fun/Liew stall is located in the Pasir Pinji market. Only operate at night this stall is run by mother/son team..Price very reasonable and it’s good. The chilli sauce.that goes together with the noodles and/liew is really good..Have a go and enjoy!!!!! Hey Andrew! You know ah, the Pasir Pinji market one at night ah, was one of my family’s favourite stall for Liew Fun!!! We ate there almost at least once a week, back when we stayed in Pasir Puteh. But since moving to a new location, we have never returned. Glad to know that the stall is still thriving. Yup, definitely one of the better ones. nice meh? i feel very thirsty after eating their noodle or maybe it’s the soup that’s the cause. but the kuey teow is very smooth. i went there quite late (only once) so a lot of ‘liew’ no more. The stadium ABC stall was owned by my uncle last time, but he had passed away. I missed his ABC very very much. Good to know that his legacy’s passed on? Having a food business is such a great idea. Will certainly visit your site more often now. Can i noe this place still worth to go now? And im bringing a 40ppl group, i wonder this place can fit it or not? Hi Eric. Which one are you referring to Eric? Thanks mama ….. have you tried that, personally? 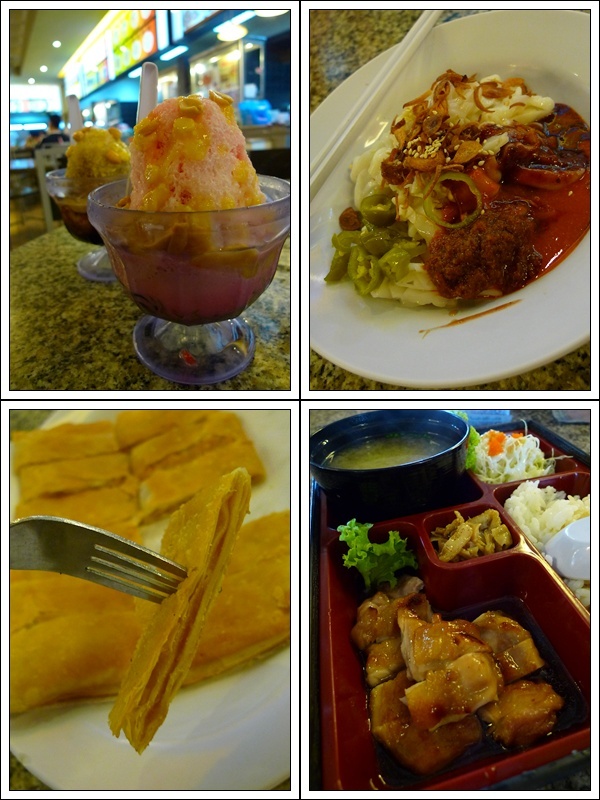 I was in Ipoh last week with my family, and I give 2 thumbs up for Ipoh’s food! Unfortunately I was there only 2 nights, which is definitely not enough, therefore, I will be back! Oh,what a pity nsalba.Never mind, come back the next time.A Don’t forget to try Ipoh famous pulut hitam angku in Canning Garden. Wheee!!! I’ll be back to Ipoh this Nov. 2013! I purposely come back to eat!